Consider for a moment all of the practice facilities you’ve honed your game on. Chances are that most if not all of these facilities had something of an issue keeping their natural grass tee lines up to snuff. When you stop to consider the sheer volume of use and requisite wear and tear it isn’t surprising, yet the cost of maintenance is often prohibitive. As we have with other areas of the game, Southwest Greens is offering the solution via our synthetic tee lines. Synthetic tee lines from Southwest Greens are a winner across the board. A winner not only for players who need the consistency and performance of a natural grass tee line when working on your driving, but also for practice facilities searching for longer lasting performance, low maintenance, and real savings. If you’re in charge of outfitting a practice facility we can help make your job easier. 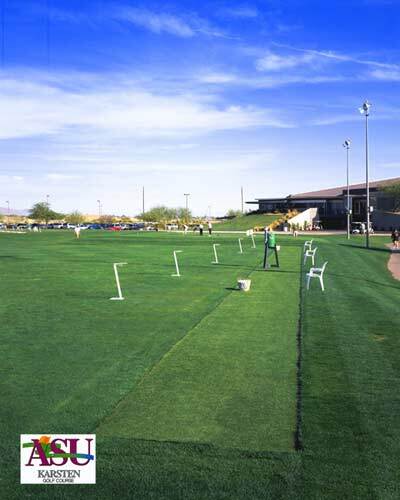 Let our synthetic tee lines do the job of natural grass at your facility.